Posted on January 21, 2019 at 6:22 pm. In an article for The Philadelphia Inquirer, Will Bunch calls for Congress to launch an impeachment inquiry into the President, in parallel with the investigation by Special Counsel Robert Mueller. Bunch notes Congress has delegated its responsibility to hold the President accountable for his impeachable offenses to Mueller, stating, “Congress and other key players have used the Mueller probe as an excuse for inaction on the dangers posed by Trump.” Bunch further states that reticence from Congress to begin an impeachment inquiry, only furthers the lawlessness of the President, and removes a critical check on the balance of power in our government. The investigation by Special Counsel Mueller does not fully account for the breadth of constitutional violations committed by the President. It is time for Congress to fulfill its duty to protect and defend our democracy and begin an impeachment investigation of the President. But it’s time to acknowledge the problem with the Mueller probe — that it’s not going to get America out of this mess. 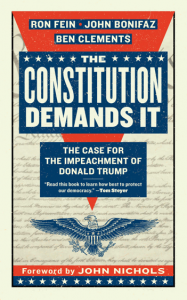 The only thing that can do that is an impeachment inquiry into President Trump, a process that will be not secretive but transparent, not legalistic but democratic in its nature. This week, the Atlantic published a remarkable piece by historian Yoni Appelbaum that lays out the case for the impeachment process to begin. He argues that some mythology about the way that the major impeachment inquiries of the past — Nixon, Bill Clinton and Andrew Johnson — played out has blinded us to the essential role that an impeachment process can play in airing a crisis like the current mess, even if the ultimate outcome is not Trump’s removal from office. Until this month, Republican control of the House — and their fealty to the Trump-Fox talk radio axis — made that a mathematical impossibility. Now that Democrats control the lower chamber, it is imperative that they conquer their decades of political timidity and exercise their Constitutional duty — to investigate the president’s fitness to complete his term. And these investigations should be conducted largely in public, in the same manner as the 1973 Senate Watergate hearings. News that Cohen will testify in public in early February is only a start. The American people demand — and deserve — much, much more. Let’s stop waiting for Bob Mueller to come down from the mountaintop. It’s time for the American people, our leaders, and our battered system to relearn how to climb that mountain ourselves. Click here to read the full article in the Philadelphia Inquirer.